It gently cleanses weak, fragile hair leaving it protected against environmental damage and feeling stronger. 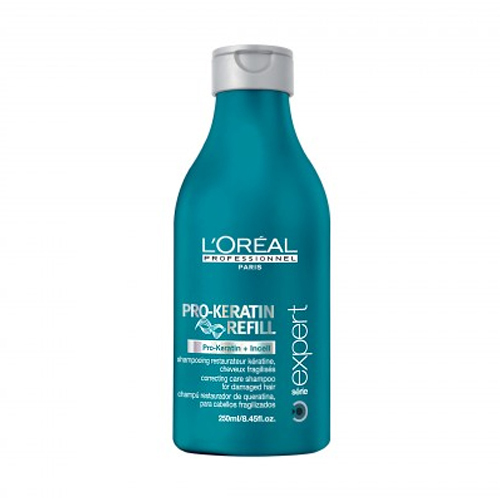 This Serie Expert Pro-Keratin Refill shampoo from L'Oréal comes as part of the innovative Pro-Keratin Refill range, designed to leave your hair feeling nourished and protected against external aggressors. Helping to strengthen weak, damaged hair. This deeply cleansing shampoo contains active ingredients Pro-Keratin and Incell, which work together to leave your hair feeling better than ever before. With an intensely cleansing and deeply nourishing formula, not only does this shampoo leave your hair gleaming, it will have it feeling up to 70% more resistant to breakage. Gently cleanses weak, fragile hair leaving it protected against environmental damage and feeling stronger. Repairs and fills weak areas inside the hair while evening out the hair surface leaving it feeling soft and supple. • Distribute evenly through wet hair and lather. Rinse thoroughly.